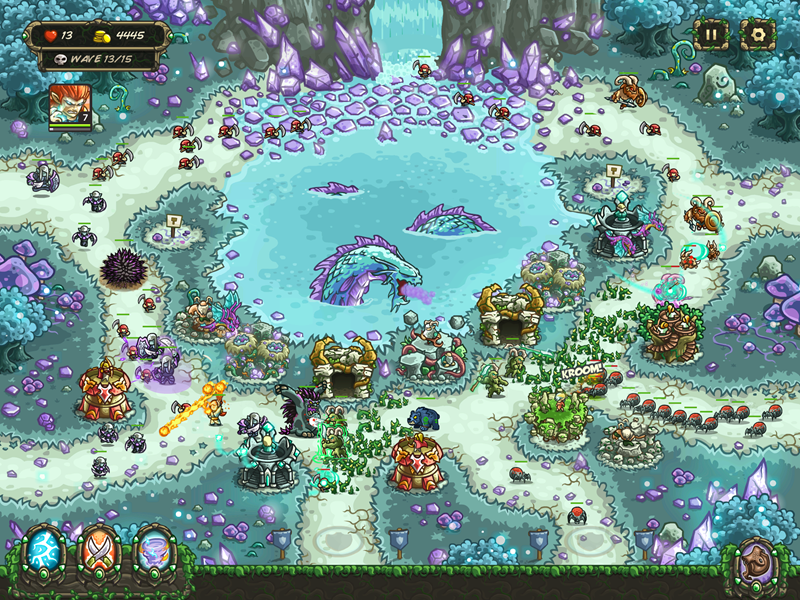 Kingdom Rush: Origins Review – KRO outta nowhere! Sometimes, all you need is a simple idea in order to create a challenging game. Tower defense games have been kicking around for ages now, finding a particular groove on mobile defenses. 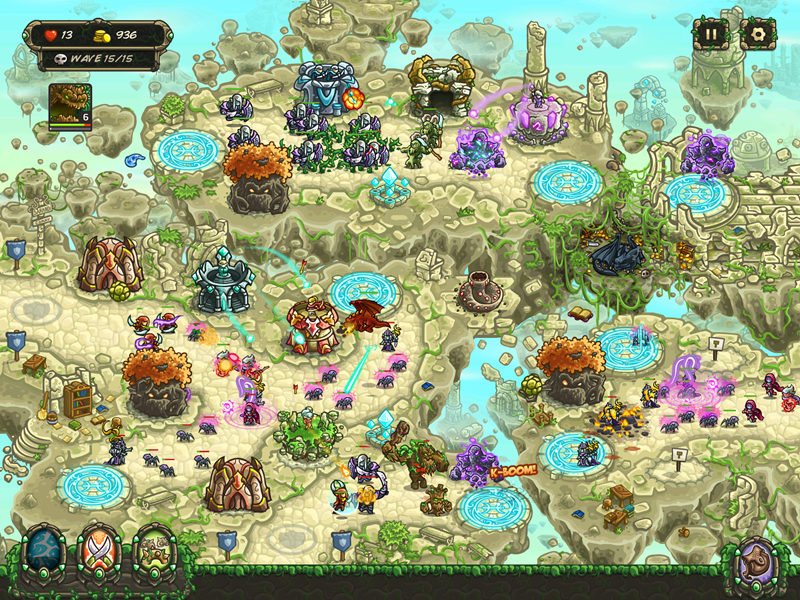 At the top of that heap, you’ll find two gems in particular, Kingdom Rush and its sequel, Kingdom Rush: Frontiers. 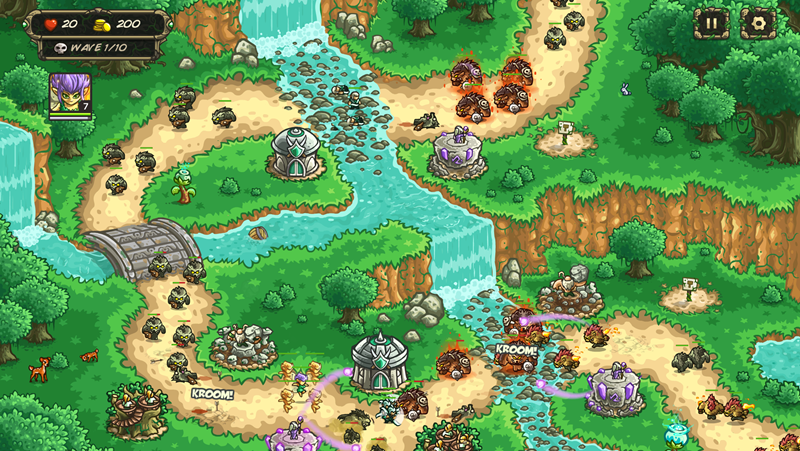 The latest sequel, Kingdom Rush: Origins, doesn’t reinvent the wheel for this franchise. But it polishes up the action for a superb and addictive experience that’ll have you tapping away into the wee hours of the morning. 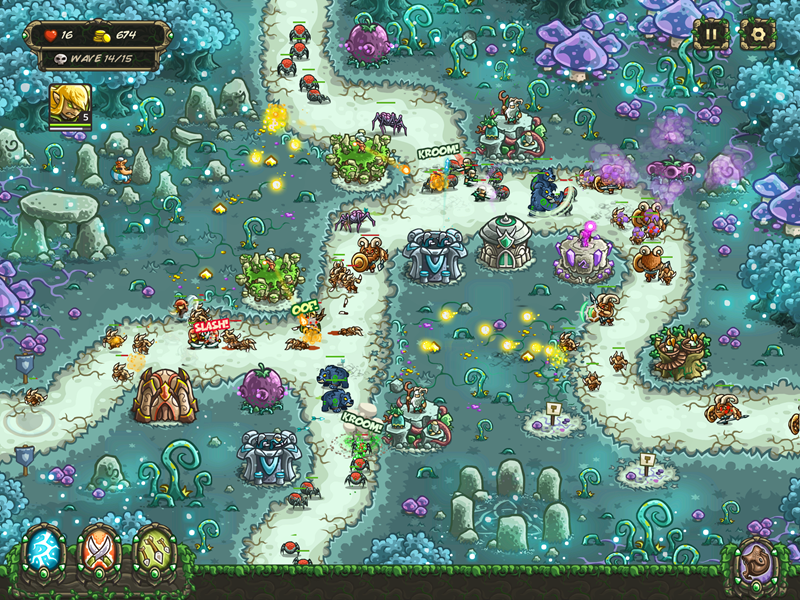 Like the previous games, Kingdom Rush: Origins follows your stock standard template for tower defense. You’ve got a map, an access point that needs to be defended at any cost and a horde of approaching enemies who range from cannon fodder to god-like bruisers that will require more than your usual tactic of sending wave after wave of soldier to die and slow down their advance. In order to fight back, players can construct one of four towers on key points of the map: Barracks for soldiers, archery towers, mage towers and splash damage artillery towers. Each tower can be upgraded with currency earned from slaying foes, until you reach a tier where you can specialise that tower into one of two variants. For instance, you might create a choke point with barracks that have been upgraded to Bladeslinger monks that can backstab enemies, or you can run a gauntlet with Wild Magus towers that pepper your foes with fireballs. From there, you can augment those advanced towers to upgrade your troops, giving them powerful abilities to slow down the enemy advance even further. Some towers are mere copy and paste examples of previous towers, but overall the selection on offer does feel fresher in Origins. Where the game succeeds however, is that the new selection of towers have resulted in a meta-game where mixing up your strategy with everything on offer feels far more rewarding now, as opposed to Frontiers where you could easily win a map with only one or two advanced towers. Completing a map with a certain degree of success also gives you stars to spend on your towers and abilities, reinforcing their strength and making your units even tougher than usual. Successfully defend a map without letting any enemies through, and you’ll nab an easy three stars. Barely survive, and you’ll only get one star to put into your skill tree of variety. And having that variety is necessary now, because Origins has enough action in it to film a new trilogy of Expendables movies. Enemies are now more devious that ever, with variants that take an insane amount of damage to finish off, while others can disable your towers or even bypass your choke points entirely. You’ll need to think quicker than usual with this game, and on the harder difficulties, set up a defense that can counter any threat possible. Amidst all of that carnage, there’s also your hero. The game throws a trio of them at you, characters that can level up and provide some serious firepower along with other abilties such as reigning lightning down from the sky or unleashing a volley of arrows to take down a small horde in the nick of time. There are also other heroes available, but they’ll cost you a few bucks. Which brings us to the elephant in the room, in-app purchases. Yes, Kingdom Rush: Origins has them. But they’re not going to impede you in anyway whatsoever. Taken straight from the more updated version of Frontiers, Origins also has a shop wherein players can buy gear to augment their strategy. The hand of Midas can double your resource generation, tools can make towers indestructible for a short period of time and an expensive bomb can straight up Nagasaki anything coming your way. To buy this gear, you’re going to need gems, which are doled out as the game progresses. Or you could bypass that, and simply buy some gems, which come in various packages. You don’t really need to however, as Origins is generous enough with the gems, and having a decent strategy can help conquer a map without ever using them, anyway. 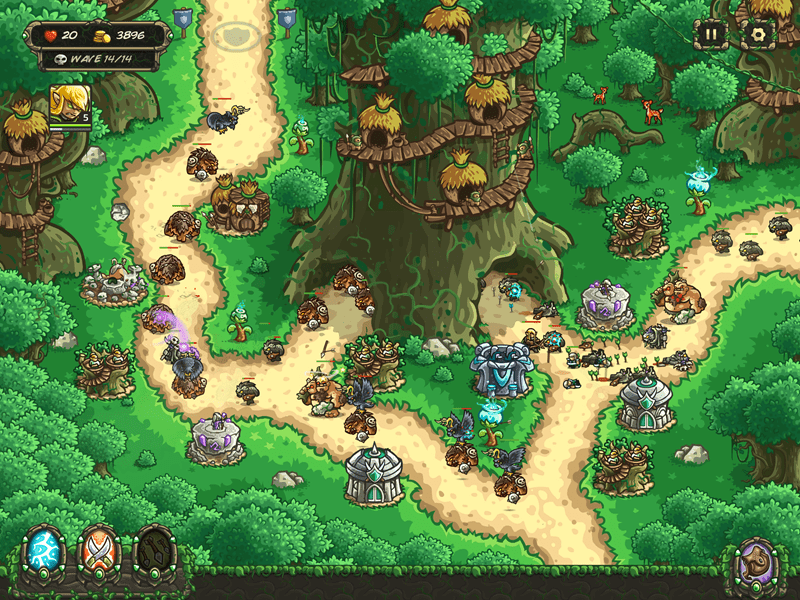 If you’ve been playing Kingdom Rush since game one, don’t expect too much to change. It’s still the same core game beneath the crispy new animations and sharper visuals, but that isn’t a negative at all. What you’re getting for your cash is a supremely well balanced mobile game, finely tuned and polished with little Easter eggs hidden on every map and a satisfyingly complex meta-game for those looking for a deep experience on the go. Tight, gorgeous and packing hours of content, Kingdom Rush: Origins is a satisfying repeat of the highlights of previous games in the franchise.